For all who commented on our country’s exclusion from the Olympics, lets not make any rash comments about this before we know the whole story. In all fairness to the relevant authorities, I am sure it was a very difficult decision to make. Lets not make it any harder for them peeps. 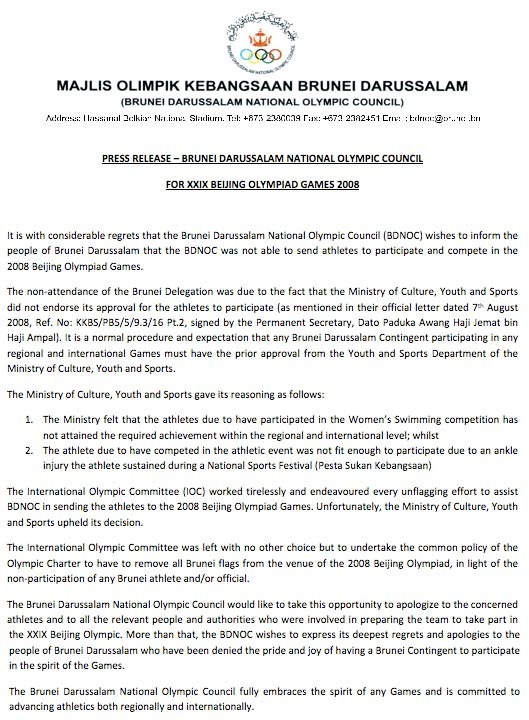 Above is the official press release from the BDNOC, now lets hear from MCYS as well in order to get the full picture. Congratulations to Jason Ong of Masamichi Studio on the official opening of his studio in Delima. Well, technically the studio has been open since January this year but Jason & his team have been too busy to do a proper opening ceremony. That means business is good! Heheh! Good on ya Jason! PARACHUTING shot! You don’t wanna miss that! bro…where is this studio to be exact?? Next post: The Orient Express Rocks!